Last trip of the Season. Just winterized all the tanks at Country Acres in Lancaster and got RoadAbode ready for storage. We were about 30 minutes from RoadAbode's storage home when Amy noticed the oven rattling more than usual. "Did you forget a pan in the oven?" I asked. Just after she checked and was making her way back to her seat when there was a loud BANG from the rear drivers side of RoadAbode. 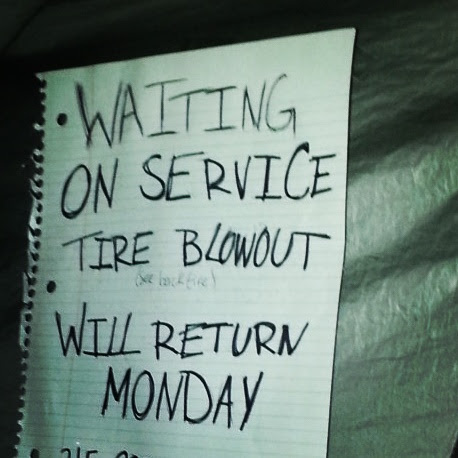 Another blowout! 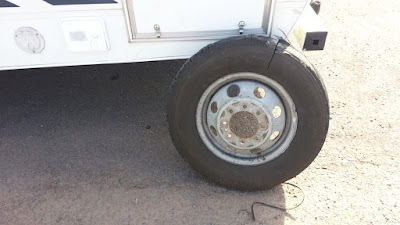 We had just experienced one on the guys trip back in July, and was planning on replacing the rest of RoadAbode's tires during the winter. As safely as possible I moved to the right to get out of busy Route 202 traffic. I pulled to a stop on a median area between an on ramp and traffic lanes. I did a quick check of damage. The fit we were towing was fine, the tire itself was shredded, and to add to the damages, the sewer valves were totally missing! I could see some of their parts already knocked by traffic curbside, but most of both grey and black tank gate valves were nowhere to be seen. 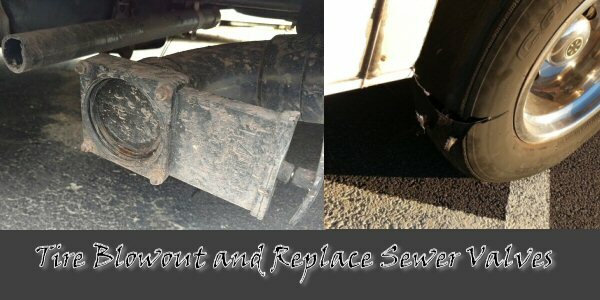 From previous blowout experience I wanted to find a safe place for service to change to RoadAbode's spare. So gingerly with hazard lights flashing I made my way off the next highway exit. Not familiar with the roadways but knowing that there are plenty of business parks in the area, Amy used google maps to find the closest off the exit. Being Sunday, their parking lots were empty. We pulled in and called our service - Good Sam - to contact a local company. After being on hold for 15-20 minutes as they tried to find a service. They were able to contact someone, but it would be five hours till they could arrive! Our location was actually 30 minutes from RoadAbode's storage, and from our home, in different directions.I let the dispatcher know this. They conferred with the tire service, and after making sure RoadAbode was parked safely, we all agreed to have the work done Monday morning. I moved RoadAbode to the far side of the parking lot, but visible to the roadway. We disconnected the Honda Fit, gathered our essentials to go home with and left a sign in case police checked on why an RV was parked in the business park. On Monday, I let my boss know I would be taking the morning off, then set off to sit with RoadAbode and wait for the tire change. Rush hour traffic was a bit more than it had been on Sunday. While sitting in traffic, I got an early call from the repair guy verifying the address and location, and that he was on his way. Then 20 minutes later - got a call that he was done! His only issue was that he could not get the spare to go up underneath RoadAbode again. 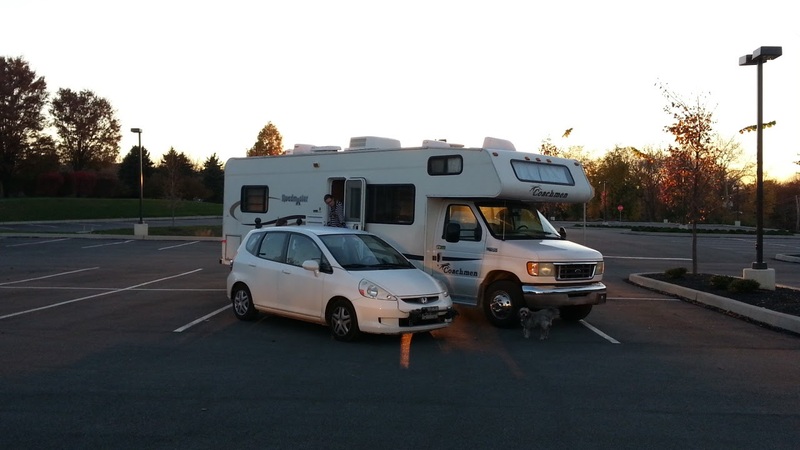 When I got to RoadAbode, I threw the tire in the back of the Honda Fit, hooked up to RoadAbode, and drove her to storage. Later in the week I setup an appointment to get new tires installed. What to take-away from this? Do have a Road Service. Even though it took an extra day, it would have been even more cumbersome without a starting point to work with. It's worth the investment. Keep your head about you. Pull to a safe place and take time to assess the problem. As long as everyone is safe - you'll get through this. Along with the above, remember it's an inconvenience. Maybe you lose some time and it will hit your pocketbook, but it's really is not that bad sitting in your RV - with a bathroom and plenty of food and drink - and waiting it out. Maybe you need some reflection time! Make sure to communicate well with the dispatcher and service. If they tell you a long wait time, see if you can find alternatives. Can they check with another service? If safe to move, can you limp along to another spot that is closer or safer? Or like us, can you arrange to do it at a more convenient time/day? Not the adventure I prefer to have in RoadAbode, but still galad to be out and travelling with her!